Apple created a new category of computing devices known as tablets when they introduced the iPad last April. iPads look like a large iPhone (here’s information on the mobile market) without the telephony (aka the ability to make a phone call.) Tablets with a 5” to 15” diagonal touchscreens are positioned between smartphones and computers in terms of computing ability and price. Since these Internet capable devices provide a rich content consumption experience through photographs and video, marketers and media executives hope that tablets will create the basis for premium paid online content products and engaging advertising. To understand the impact that tablets have had on the mobile computer market, here are 30 tablet-related facts along with analysis and charts. 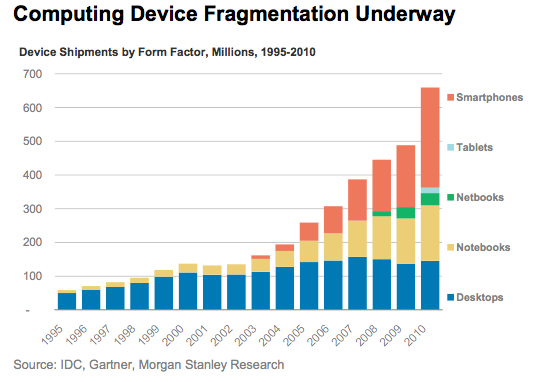 As the computing market evolves it’s becoming more fragmented. The market penetration of tablets is still small but projected to grow and cause a decline of sales in other segments. 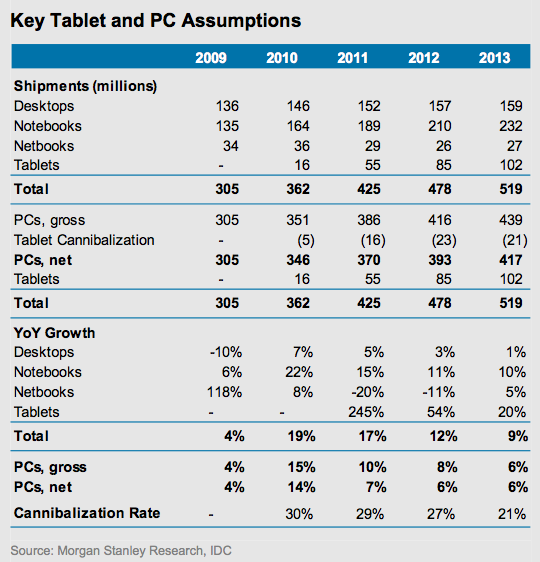 Tablet shipments could reach 100 million by 2012, reducing PC market growth by 3 percentage points in 2011 and possibly more over time, based on Morgan Stanley‘s findings. 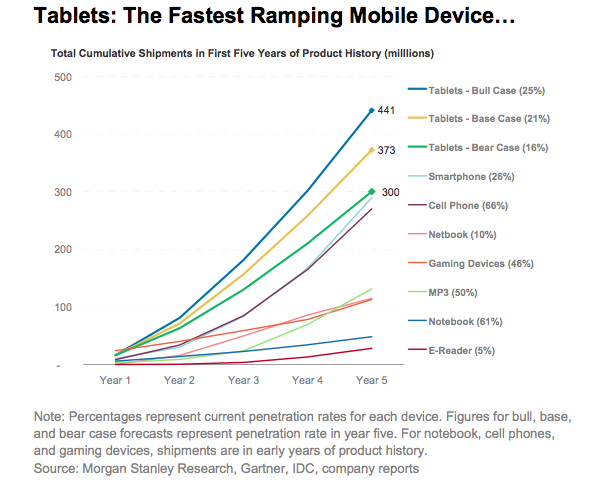 Further, tablets are an additive and not a substitute purchase to the broader computing market. 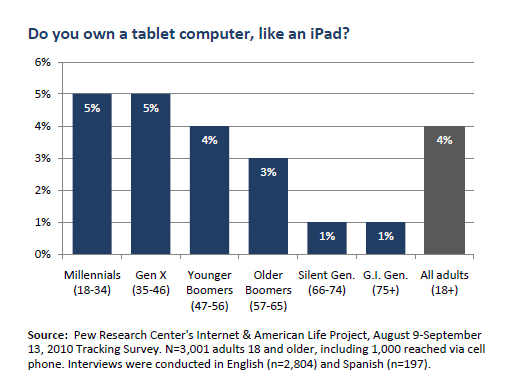 Based on Pew Research, tablets are nascent markets. At an overall 5% market share, e-books don’t have much more penetration. 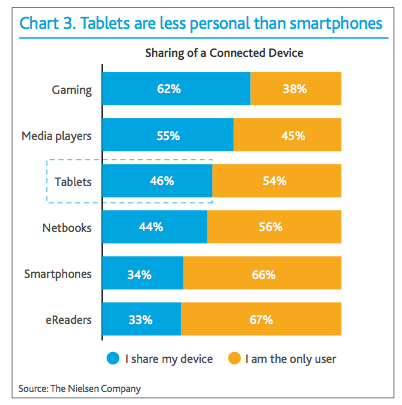 The Nielsen Company shows consistent tablet penetration. What’s important is that roughly half of respondents who consider themselves “early adpoters” have a tablet. 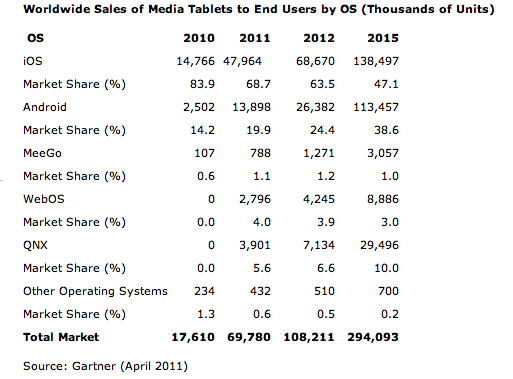 This group owns more tablets than other devices. Further, the research showed that owners had six connected devices. In terms of demographics they were mainly male and under 35. 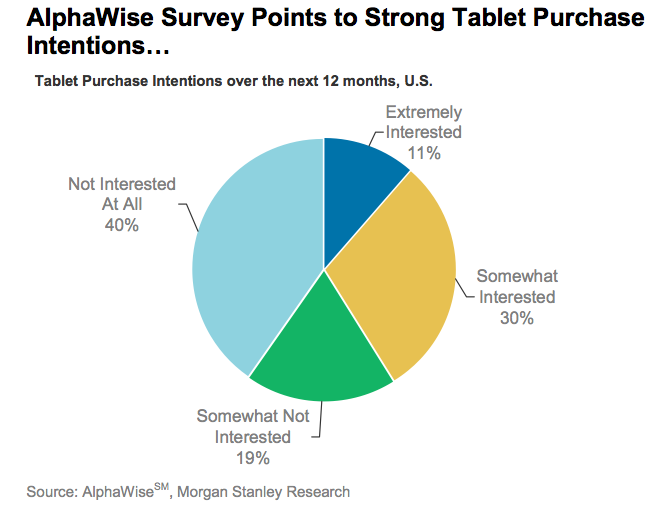 Consumer purchase intent is important driver of tablet sales. Here’s Morgan Stanley’s findings. 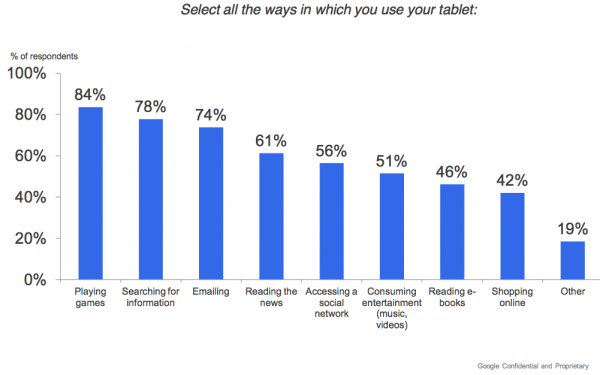 When choosing a tablet, consumers tend to be loyal to their smartphone’s operating system for ease of connecting information, according to Gartner. 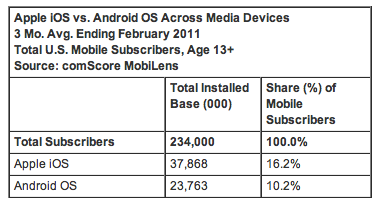 As a result Android OS smartphone owners are more likely to cross over to Android-based brands of tablets. 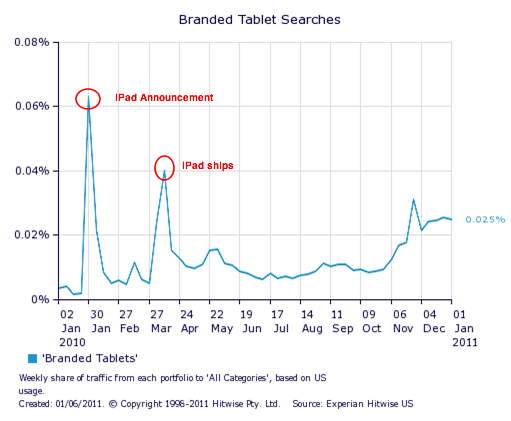 Here’s first year trend for branded tablet searches. According to Gartner, Apple is expected to dominate the tablet market through 2015 when they’ll have 48% of the 294 million unit market. According to Gartner, Apple’s competitors overlook the importance of their apps, service and user experience (aka UX) in favor of hardware features. 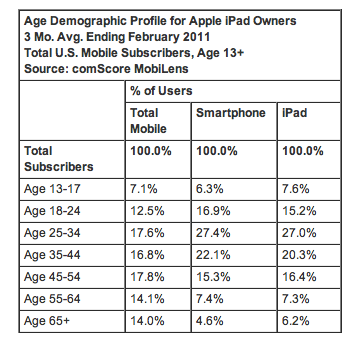 iPad ownership is highest among 25-44 years olds, which is similar to smartphone usage. According to comScore, this may indicate a need for greater mobile capability. iPads: Not for Apple owners only! 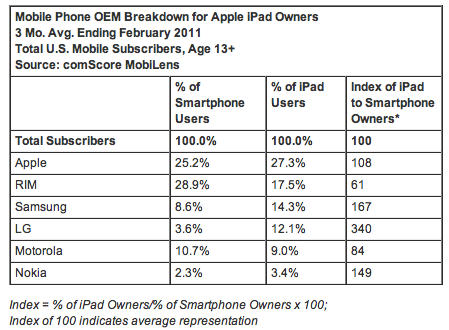 While many iPad owners have other Apple products, iPads index well for other types of subscribers. 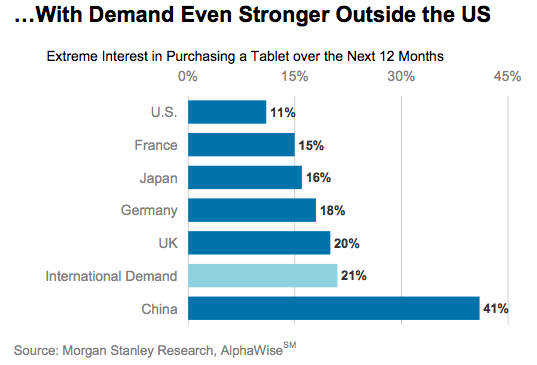 Tablet interest is greater outside of the US. 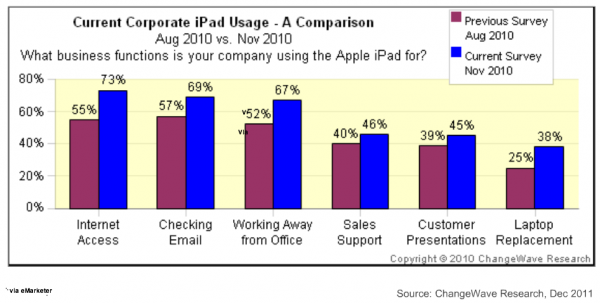 iPad is used daily by over 85% of owners. 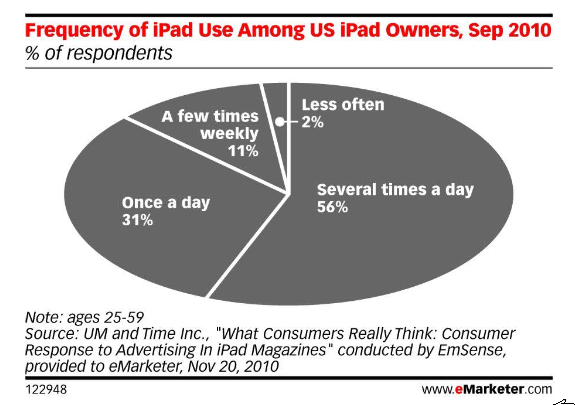 Over half use their iPad several times a day according to research by EmSense supplied to eMarketer. 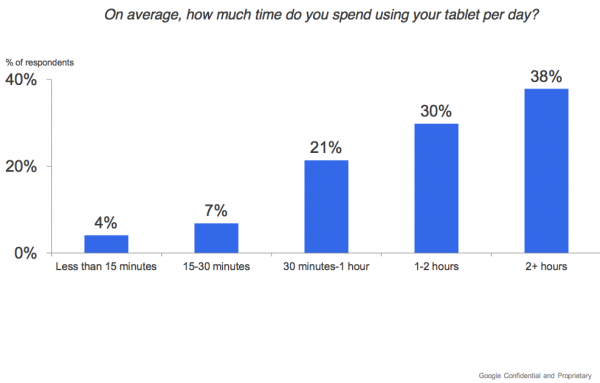 Roughly two-thirds of respondents spend over 1-2 hours using their tablets per day according to AdMob research by Google. (Note: This research broke out usage in hours.) The research found that respondents spent more time at home using their devices. Further, the devices were used more during the week and at night signaling that it’s a entertainment consumption device. 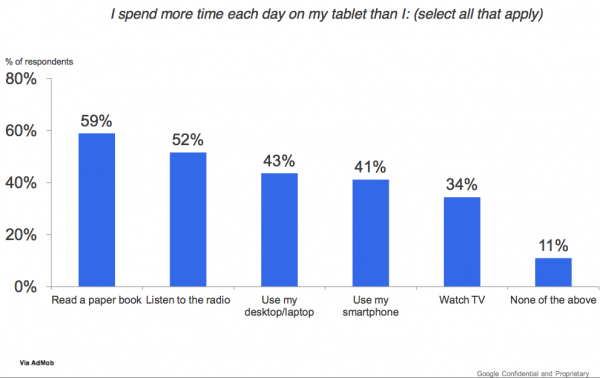 Based on AdMob research for Google, over 40% of respondents spent more time with their tablet than their computer and a third spent more time with their tablet than television. iPads are more likely to be shared connected devices than smartphones. 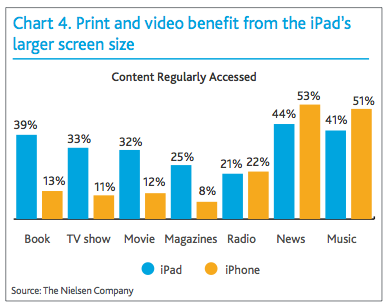 As content consumption devices with Internet connectivity, tablets are seen as having the potential to persuade users to pay for content such as print publications such as newspapers and magazines. For marketers and media executives, the amount of time that owners spend using their tablets is an indicator of engagement. 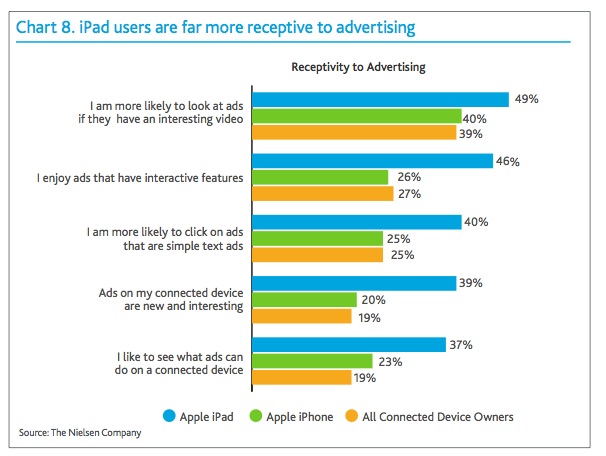 This is particularly critical in terms of the long term potential of advertising on tablet devices. Of course, media entities will need to be able to create consistent formats across all devices to make it an effective option for advertisers. Among the top three tablet activities according to AdMob’s research are games, search and email. 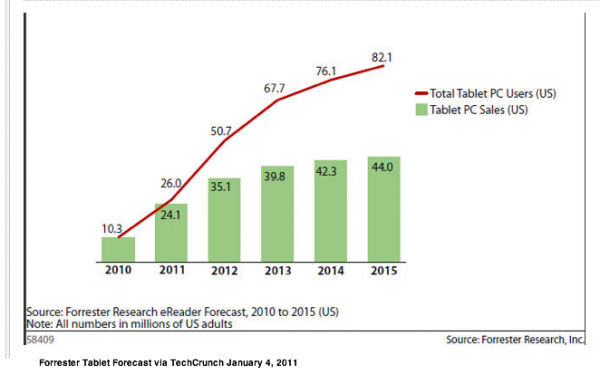 Tablets are becoming content creation devices. 20% of tablet owners also them to create or edit files regularly compared with 34% of netbook owners and 56% of notebook owners that regularly use these devices to create or edit files. 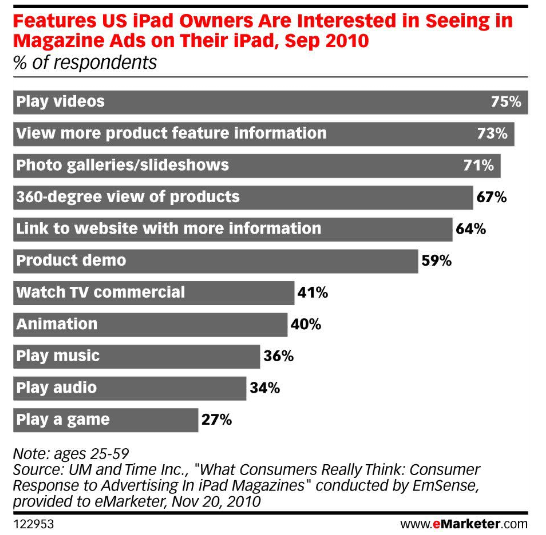 Of interest to marketers and corporate technology executives is the fact that iPads usage and functionality had expanded. It’s the physically light alternative for computer functionality. Based on this research by Change Wave, it’s the go to device for staying connected and consuming content as well as sales facing functions. 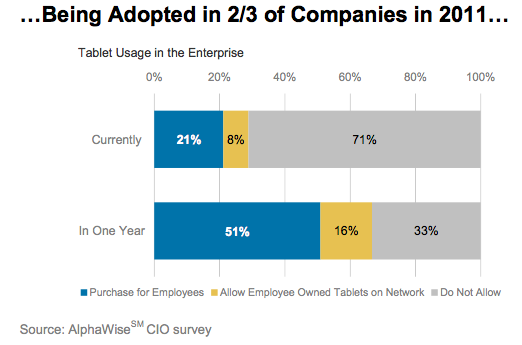 Tablets expected to be allowed on two-thirds of company networks within a year. 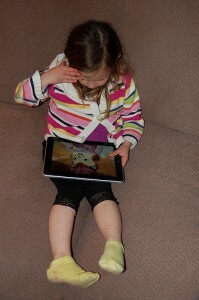 Apps are an important element for tablet content consumption. 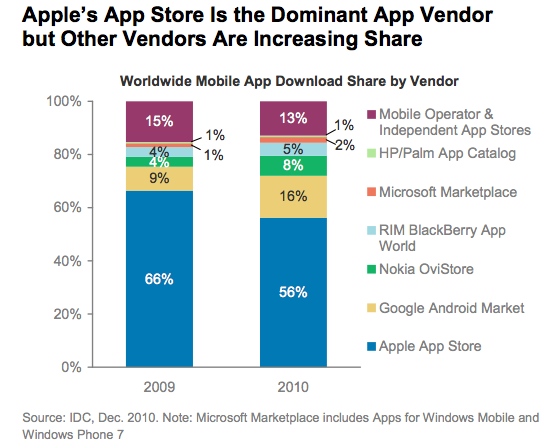 In the short run, Apple is driving usage. 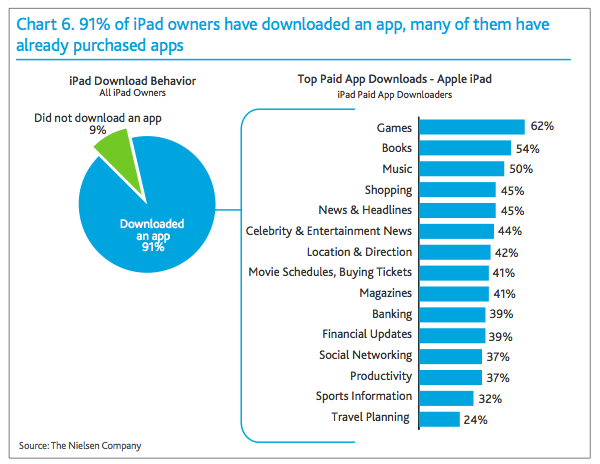 Over 90% of iPad owners have downloaded an app. 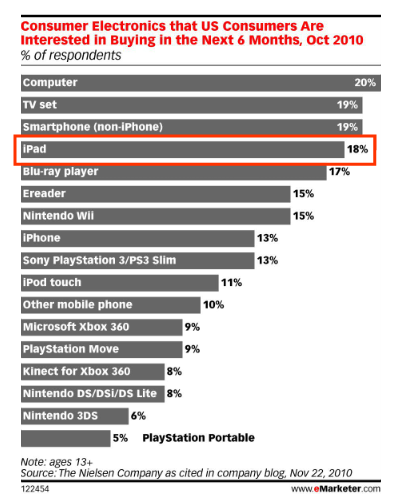 The most popular categories are games, books and music. This shows that there’s still a market for creative endeavors. 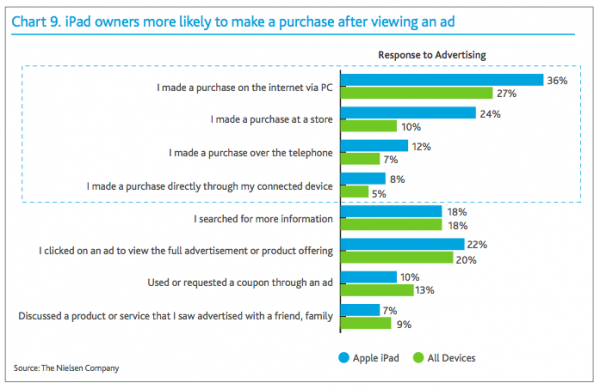 The good news for marketers and advertisers is that in general tablet owners are receptive to advertising. In part, this may be attributable to the newness of the medium. As a result, there may be a lower level of ads and the advertising that appears is designed for the medium. As with any new device or advertising platform, early advertisers will benefit from higher response rates (although the overall universe is smaller.) Additionally, they may have the potential to leverage the PR value of their usage. Is print still relevant in a Tablet-driven world? If you’re a marketer, here’s are features worth integrating into your tablet experience. Note that videos tops the list. Owners are used to television and video. 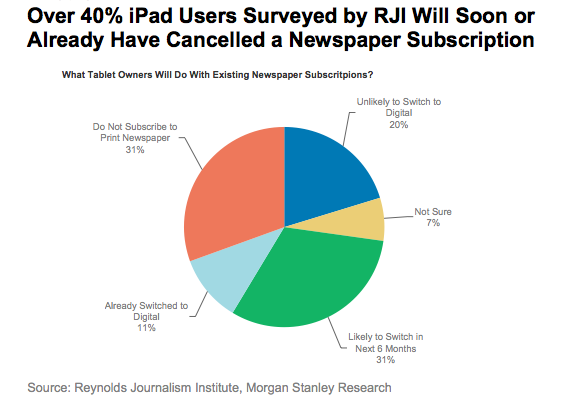 According to Morgan Stanley’s research, tablet users are canceling print newspaper subscriptions. According to The Nielsen Company’s research, viewing ads on a tablet translates to sales. 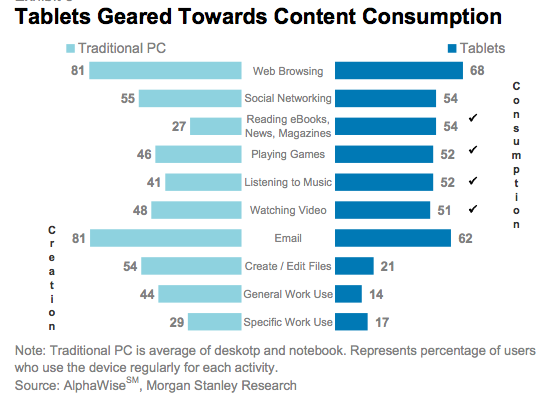 Tablets have changed how, when and what content is consumed. This nascent market continues to evolve at a rapid rate. Marketers and media executives need to appreciate the strength of tablets and the need to have content formatted for easy use on these devices. As with any new product, consumers want to use them so that content and apps are critical to start building your installed audience. Further, given the newness factor, testing new forms of advertising and sponsorship should yield strong results. Have you developed content and/or apps for tablet usage? If so, what was your experience? How do you think that the market will evolve? Hat tip to my webmaster Larry Aronson for his help assembling this post. Tags Android, E-Marketer, Gartner, iPad, Morgan Stanley, Pew Research, Tablet. Bookmark the permalink. Thank you for putting these charts together, I liked that you started with an overview type information and then went into details of content consumption and advertising relevancy. Was also glad to see one international visual about international expansion. Thanks. Heidi, these charts are fantastic and very helpful as I am building a business plan based specifically on this niche (for now) market.